Real IGN Maps 1:25,000 – no need to buy separate maps. Real IGN Maps for each stage: 1:25,000. Unique Itinerary Planner: plan a bespoke itinerary to match your ability and vacation schedule. All difficult calculations of time, distance and altitude gain are done for you. 6 Proposed Itineraries of between 7 and 12 days. Everything the trekker needs to know to plan the route: route descriptions, costs, budget, difficulty, weather, how to get there, and more. Full accommodation listings: spectacularly situated mountain huts, villages and hamlets. Complete list of every camping location, including free campsites. 10 exciting variants to the main route. Information for both self-guided and guided trekkers. Edge to edge colour: the most modern and beautiful TMB guidebook. 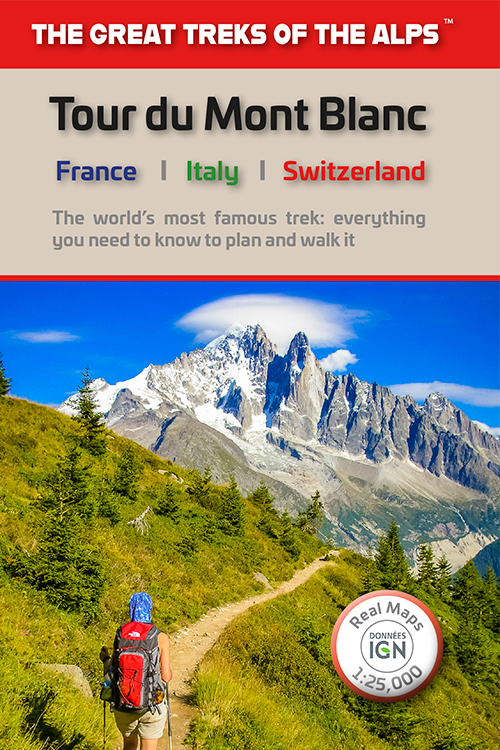 The Tour du Mont Blanc is the world’s most famous trek and starts near Chamonix in the French Alps. This book has everything you need to know to plan and walk it. Unspoilt and remote high mountain terrain: snow frosted summits, beautiful valleys and pastures, sparkling azure lakes, carpets of wild flowers, the soothing sound of cow bells and easy to follow paths. This trek should be on your hiking bucket list.